We were going to run 15 miles today. We didn’t. We did run though. Let me start at the beginning. It has been another stupid and stupidly busy week. Work has been relentless for both of us. We didn’t manage another run after Tuesday’s 45 minutes. Yesterday we flew out to Hamburg for my Dad’s birthday which is tomorrow. Our flight wasn’t until the afternoon so we decided to do the 5.5 mile walk as per our plan before we set off. It was a nice walk and we stopped to feed out sheep on the way round and chatted about Disney plans and emptied our brains of work stuff. We were exhausted when we got home though. We were beginning to be a little pushed for time so we actually only walked 4.5 miles. We made up for the missing mile with a mad dash across Amterdam Schipol airport to make our connecting flight, just. As I said I had planned a route that was 15 miles but it did involved 3 loops of the Alster. We got up at 6am, forced down about half of a porridge pot each, forced ourselves out the door and took some deep breaths. We hadn’t slept well, even a relatively quiet area in the city is noisy when you’re used to the complete silence we have at home and unfamiliar beds never make for a good night. Neither of us really wanted to go. Neither of us felt particularly bright. We walked, for about 5 minutes and then started the run. 2 minute runs, 30 second walks. 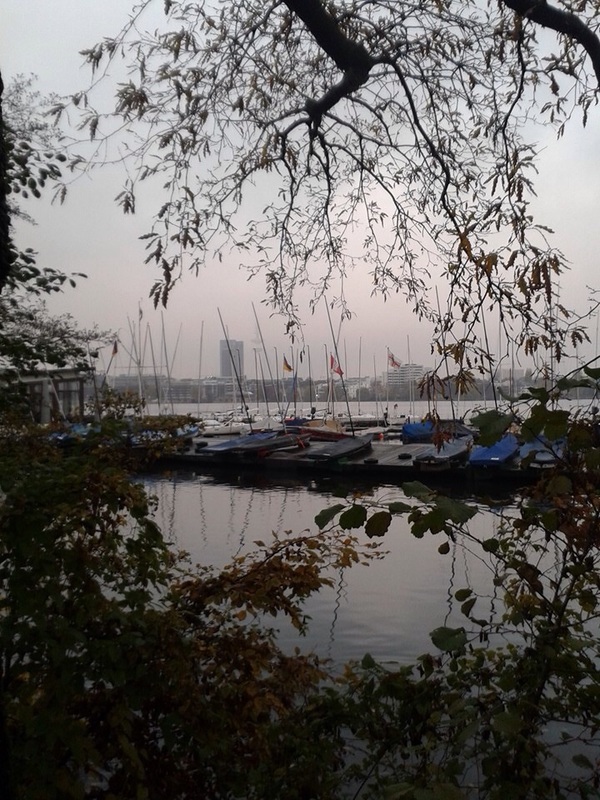 The first mile and a bit was just along a residential street, then we hit the Alster an decided to go clockwise. It is quite a nice route and there were a fair few runners about. 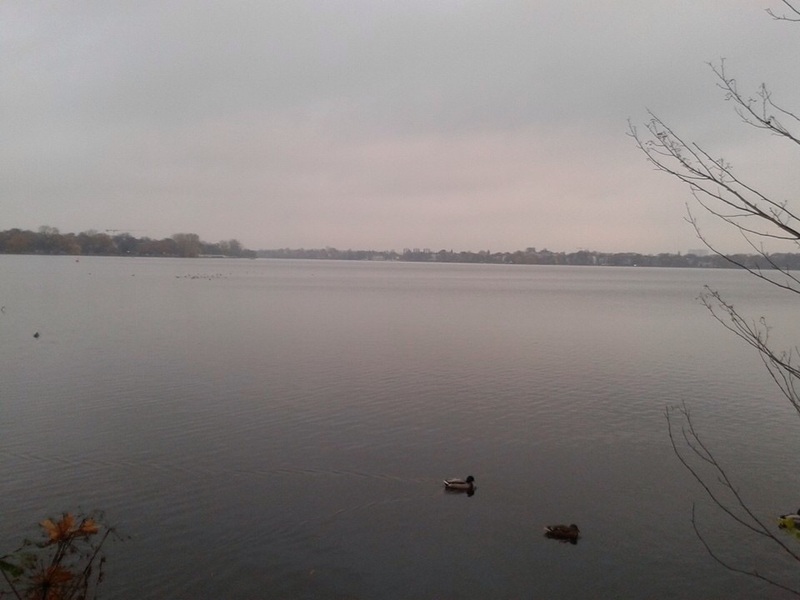 There were also ducks and geese and swans, a few dogs and walkers, some people just going about their business and some very serious, and not entirely happy looking, people with two walking poles engaging in what can only be described as skiing without skis. It was hard going. We walked a lot and plodded along at a slow trot in between. It was unusual because we were both struggling so we made the decision to turn the run into a positive and just do one loop of the Alster. By the time we had done that and got ourselves back to a cafe that looked like a good option for breakfast we’d completed 7 miles. I don’t know why we found it so hard, maybe because we hadn’t eaten the right sort of stuff at the right times yesterday, or maybe we hadn’t drunk enough water, maybe there wasn’t a long enough gap between porridge and running or maybe we are just tired, properly tired. We have decided to rest tomorrow and then possibly do another loop on Monday and see how we feel.